"made by international FM team"
Nice! Thanks for the detailed info! I will Research. But in the house. I am at work. Interests:Clan leader of clan .:*BiA*:. Weapons, Tactics, ASG,Aviation,Ponies,STAR WARS, WH40k. Answer 1. Because they have increased XP and Lion gains, and Gaijin doesn't want to see another D13 fiasko in HB's. - That would be my guess anyways. That's not legit, they're meant to have worse performence than their allied counterparts due to the usage of foreign fuel by their serving country as well as insufficient maintanence, thought the german P-47 seems to be too much worse than the allied one (4m/s less climb and 50km/h less topspeed seems just ridiculous, I hope this will change). After all the intention behind these changes are acceptable, but you should keep it in a way not to make premium planes too unactractive in order to attract players to buy them...I can't imagine somebody buying the P-47 with this kind of poor performence. Bf109 G6/R6 most used models . Most of the time, is considered as the main model. Wiki pages doesent count, only original documents please! Okey . After work. But, G6 will never be slower than g2. It was given to you at a previous page! G2 as well! Can you please check out Corsair"s climb rate? I think its too high. The speeds are OK. I though they are overtuned too but I found out more material where I can see huge difference between military power and WEP using water-injection system. Also I ve noticed that U-1c has better climbing and turn-rate than U-1d. I have somewhere document which can maybe help you because there was a take-off weight comparsion of those variants. U-1c is heavier due to Hispano MkI/AN-M2 cannons. The pilots notes are also saying that U-1c is less agile than 6x50cal Browning version. Please Trojan take a look at these documents and compare them to notes your teams have to clarify any clerical errors. 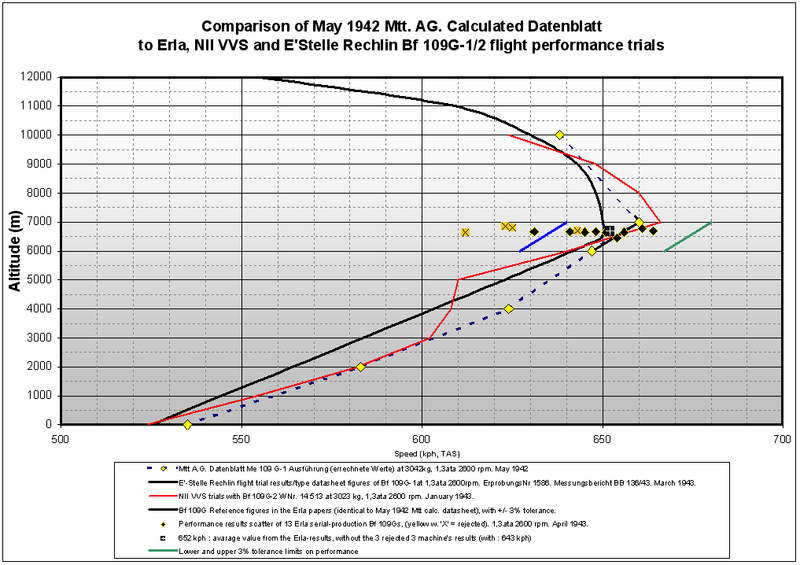 yes, plus it should be noted those graph were made from tests using the standard 92 octane fuel of the FAF, that is, richer than the fuel then used in the Luftwaffe (87 octane). Other tests were done in the CEMA which indeed reached a top speed of 570km/h... Pushing the engine to the limit and using 100 octane fuel! Please Gaijin guys, keep in mind that was a time of great propaganda... You'd better double check every document! 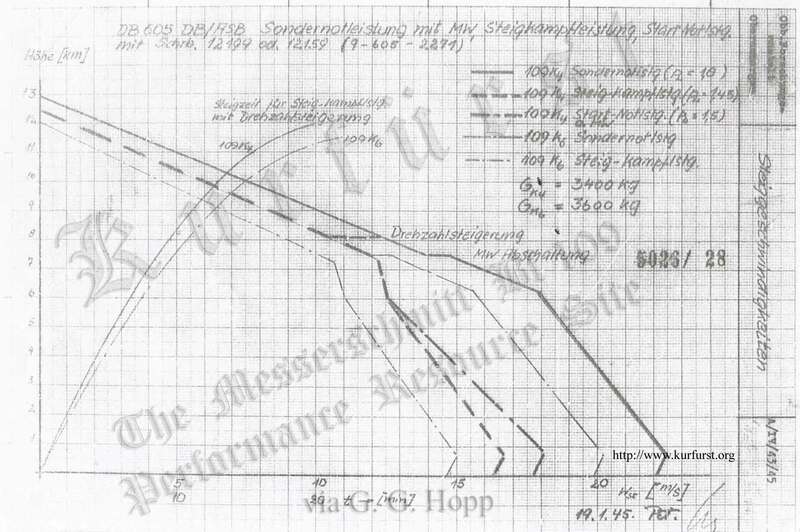 under the wings of the ME 109 G.
Sea level speed = 316 mph (509 km/h) after corrections. If you read the above, it says they needed to open the radiators due to high coolant and oil temp, the engine begins to overheat at higher altitudes.. There is no way the BF 109 E-3 could ever manage 20 m/s climb speed perhaps 17m/s radiator closed. 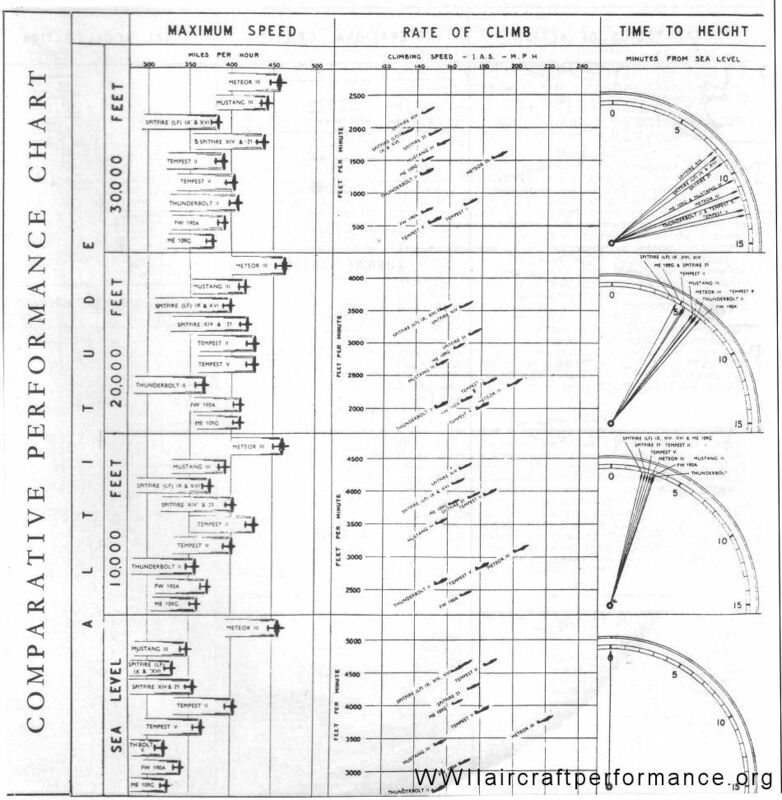 What's the point of posting random performance charts based of flawed tests of captured aircraft? The German P-47 also has the lowest reward stat of any other tier 9 fighter, even less than tier 7. This plane is already unattractive and will be completely pointless if these nerfs to its stats are implemented. It is better than your G-2 and G-10 figures. I don't have any performance tests of virage, but I really can't imagine how kurfurst with gondola guns can have virage time better than gustavs without it. Gustavs have lighter wing loading. Bf-109K-4 without gondola guns and with MW-50 had max climb rate 22,5 m/sec. Bf-109K-6 with Mk-108 gondola guns (this modification is roughly equal to our game model) have only 20,25 m/sec. At SL Bf-109K-4 with Mk-108 gondola guns perfectly tuned, gj. 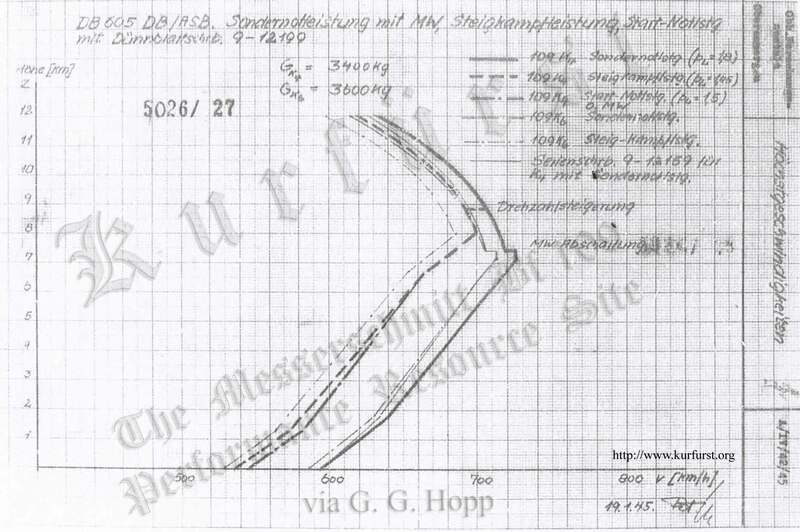 But at 7400m Bf-109K-4 with Mk-103 gondola guns can reach only 707 km/h. Speeds for the bf 109 are wrong. Results based off table 4 in the following page. Still the Germans have better then historical performances...and appear to have a much greater speed then what has been recorded. Same with your G2 data, Allied tests, especially the early 109 ones were flown with crashed or improperly maintained planes, so why bother? You are undermining the effort to bring the planes into the real shape. Stop it. German sources are very close to the Allied. It is impossible for K4 to reach 24m/s with gondolas. It had max 22,5m/s without them! See that post, the data from the links are in German! 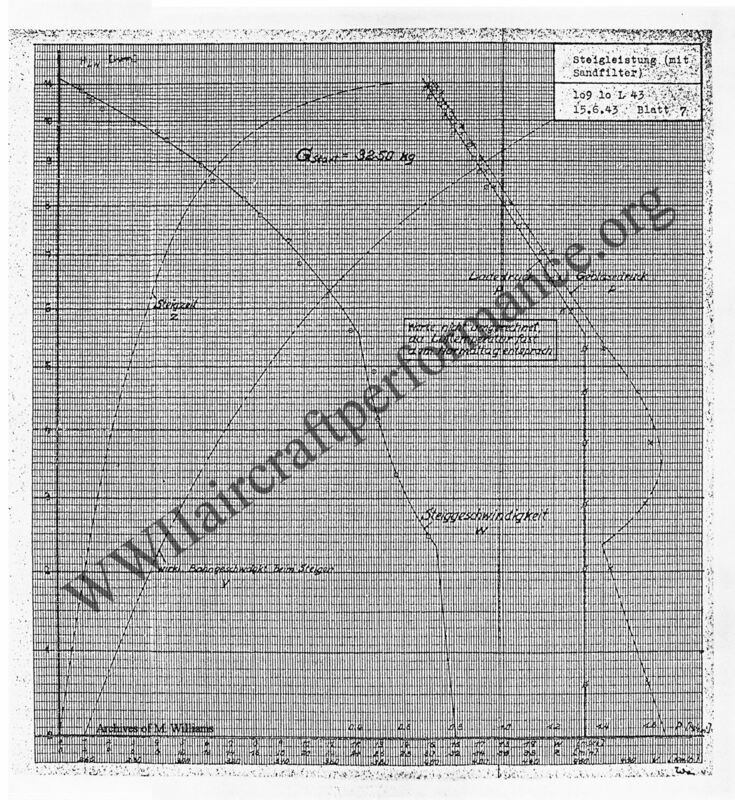 Bf-109K-4 without gondola guns and with MW-50 had max climb rate 22,5 m/sec. Bf-109K-6 with Mk-103 gondola guns (this modification is equal to our game model) have only 20,25 m/sec. At SL Bf-109K-4 with Mk-103 gondola guns perfectly tuned, gj. But at 7400m Bf-109K-4 with Mk-103 gondola guns can reach only 707 km/h. The climb rates are too high regardless of source!